The last few years, we started top X lists of a few things as we started to note how this or that was one of the “best we’ve ever tasted”. The list has started out with pizza and burgers, two classics where “best” is subjective. It’s fun to enjoy a good burger or pizza and try to determine if it “makes the list”. We don’t go “searching” for the best burger or pizza but when we eat but we inevitably revisit our lists if we stumble across a great one! 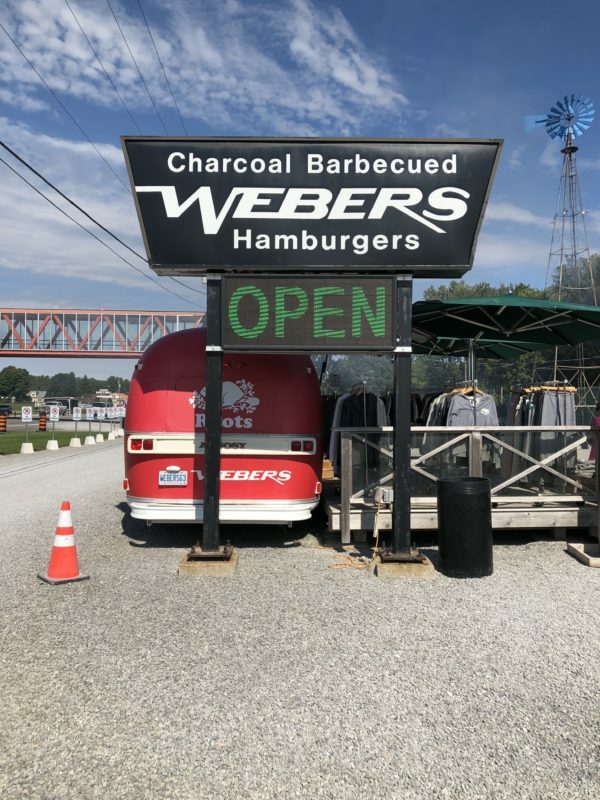 I was at Webers on Highway 11 twice in this weekend and it reminded me that I’ve never documented “the list” so I’ll start with my existing favourites and then elaborate more on Webers. Randy’s was a relatively short-lived place, in an area of Hamilton I would categorize as not a great location for a restaurant. They had GREAT burgers. Handmade burgers from grass-fed beef, homemade condiments, hand-cut fries I believe fried in beef tallow. I loved that they had various size options, 2/4/6 ounce burgers. What was a big negative was in making everything for you when you ordered it (including weighing the meat for the patty), it took forever to get your order. Combine that with limited seating (3 stools?) and I think it was a bit of an uphill battle to keep customers. I thought the quality was worth the wait but many disagreed. The Hamilton Spectator ran a good article on them back in 2012 but they’ve been closed for at least 4 years now. Chuck’s was on Locke Street in Hamilton, a great area for restaurants. I don’t know much of their history but doing a little research for this article led me to some interesting commentary that I can’t verify. If I believe what I read, there were issues all over the place from building inspection issues to bankruptcy to landlord disputes. Whatever their issues, I enjoyed the couple of burgers I had there, and was disappointed to see it go. One of my long-time favourite burgers was the all-pork Harmony Lunch burger. The diner in Uptown Waterloo was there for decades, opening in 1930. The original owner retired and sold the building and the business – but not the burger recipe! – in 2016. I was lucky enough to get one of the very last burgers they sold on their last day in business in October 2016. The burgers were small, but tasty, covered with fried onions, relish, mustard and tomato (“the works”). Harmony Lunch was renovated and brought back by new owners but without the original recipe. They have tried to recreate the original burger, I tried it earlier this summer and it’s just not the same burger so for me, it’s off the list! This was a random one. While on a trip a couple of years ago, we toured through New Brunswick and ended up at what looked like a hole-in-the-wall kind of diner. It ended up being on my of the tastiest burgers I’d ever had. I can’t find a website for them but here’s a link to their Facebook page. If I’m ever in the area again, I’ll definitely try it again to see if it still stays on the list. This is another kind of random one, from another trip. Once again, it was a great little place and a great burger! Here’s a link to their website. Ditto what I said above, next time I’m in Kingston. One of the local favourites for me is one where I live. The oddity with Little Louie’s is their hours: they are closed on weekends! So many times I have a craving on a weekend for it and I forget, but it’s not a place I think about eating Monday to Friday… but they do have good burgers. They were featured on You Gotta Eat Here a few years ago, on the Food Network Canada. Webers is a Canadian landmark, or at least an Ontario landmark to be sure. I would be willing to bet there are not a lot of people who have driven to Muskoka on Highway 11 north of Toronto and NOT stopped at Webers at one point in their life. With most well-known places like this, you either love it or you think it’s completely over-rated. I happen to love it. 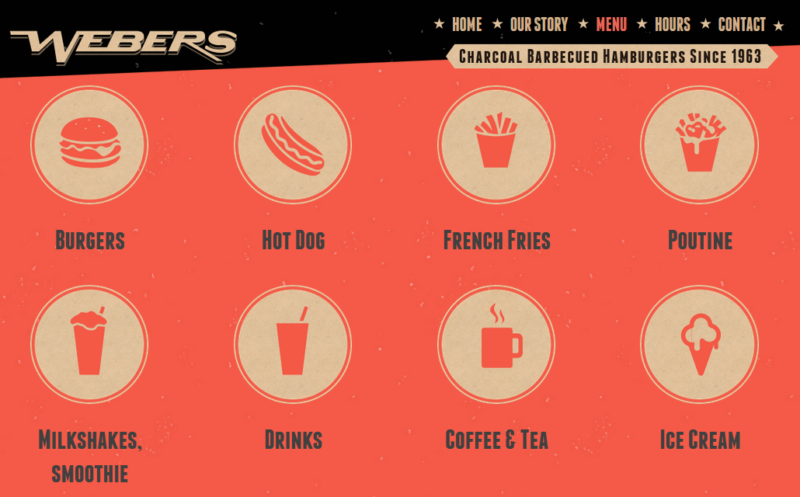 Located in Orillia, Ontario, north of the town itself, Webers is right on Highway 11. Thousands of people drive by every year and stop in for a burger and this weekend I was one of them, twice! I’ve been going there ever since I’ve been going up north, as young as I can remember eating anywhere. 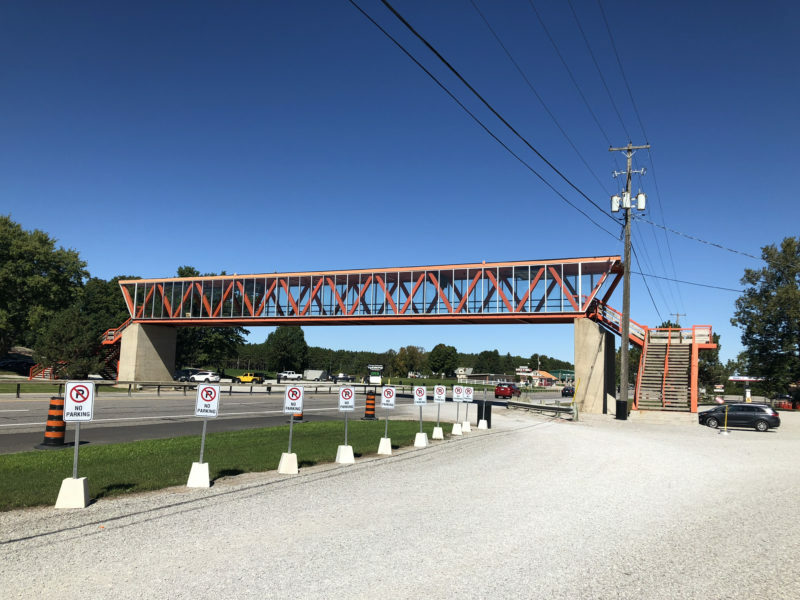 Anyone travelling up there knows to look for the iconic orange walking bridge that spans Highway 11, to slow down from your 100km/hour highway speed to get into the driveway! The bridge is to allow southbound travellers to enjoy the burgers as well as it’s a divided highway. Miss it, and it’s several kilometres later when you get to an exit with a turnaround to come back! I will always try to time my trip with lunch or dinner just so I can stop in for a burger! The bridge itself was installed in 1983. In 1981, the province installed a median on Highway 11 that prevented anyone southbound from accessing northbound establishments, and vice versa. Now patrons can safely cross the highway and there is ample parking on both sides of the highway. I was surprised to see the Webers side (northbound) parking lot seemed to be quite a bit larger than it was the last time I was up north. One of my favourite things about Webers is the simplicity and efficiency in which it does business. 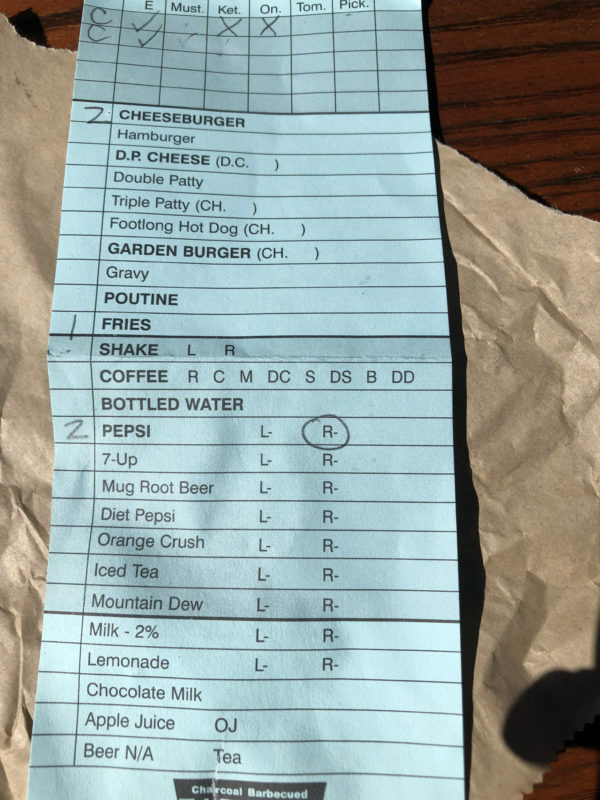 The menu is simple and has never changed: burgers, fries, shakes, etc., a small simple menu. Simple toppings also keep the business running quickly (the fewer the options, the lower the complexity). The business operates like a well-oiled machine. The lines are long and the service can take a while, but only due to the lengthy lineups. While you’re lined up, employees will come out and take your order via a simple paper slip – what you want to eat and drink plus what you want on your burgers/hot dogs. They work their way through the line taking orders as the lines evolve. Once you have your “paper” order, runners (as I can them) come out and take your slip back in to get a total. It’s a cash-only business so what makes this quick is when the runner comes back out with the receipt for the food, they are also coming back with the exact change for the most common payment amounts. 99% of the time, that means they have the correct change for you and no extra trip back to get change. It’s brilliantly simple and super efficient. By the time you get to the “front” of the line (i.e. actually are getting inside the building), you’ve paid and all you need to do it get through the line to pick up your food. The kitchen is busy with the burger gang over the charcoal grills making the burgers, cooking the fries, heating the buns etc. while the final step is the preppers putting your condiments on from your order sheet. It seems like well-organized chaos inside but they have a system that works. There is someone who appears to be expediting the orders, from the time the runners bring the slips in for payment, to ensure the right food is on the grills by the time the person gets their way in the door. 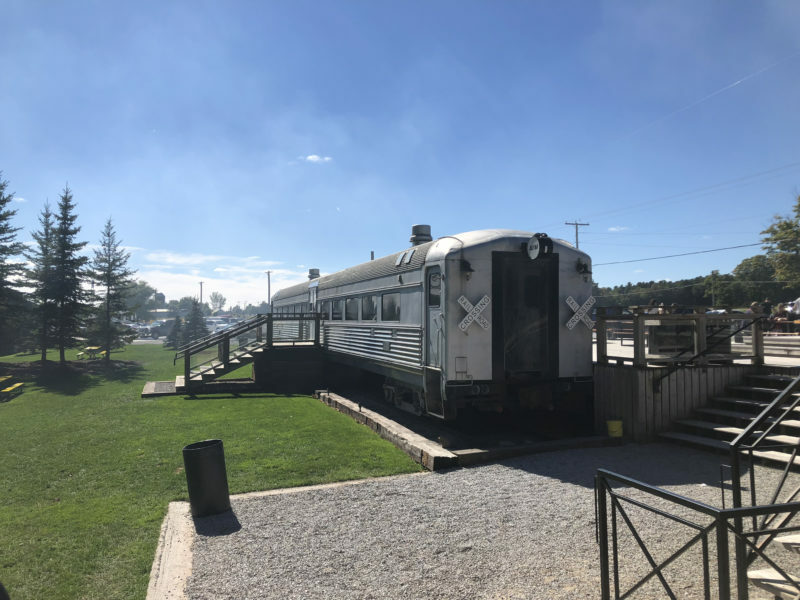 They’re known for their train “cars” where you can sit inside and eat, or there are plenty of picnic tables around the property to sit on to eat. I believe they have 3 or 4 train cars onsite now. This time around they have a “new” Starbucks trailer (I haven’t been up in a few years so I don’t know how long ago that came in). The last couple of times I’ve been up there, they also had a Roots trailer onsite (behind the Webers sign picture above) with branded Webers merchandise from Roots Canada, another iconic brand. Overall, it’s a great place to go on any road trip north to cottage country and Muskoka. I don’t head up there very often but when I do, I always try to work in a Webers visit! Love your list & fully agree with your list of locations. Mel’s in N.B. was fantastic, loved the old diner style setup.